A Pathya Vat is a form of poetry originating in Cambodia. It can be of any length, but each verse is organized into 4 lines, each line having 4 syllables, with the middle two lines rhyming. In subsequent verses, the middle lines rhyme with the last line of the previous verse. My Pathya Vat is two verses, rhyming ABBC | DCCE. The rhythm of my poem is the reverse of iambic rhythm, which is called trochee rhythm. The rhythm is stressed (or accented), unstressed (or unaccented), stressed, unstressed. Iambic would be unstressed, stressed, unstressed stressed. A 4 syllable line is called dimeter, because it has two “feet.” A foot is a grouping of two syllables. Iambic pentameter has 10 syllables (or 5 feet), with careful attention paid to the rhythm of the accents in the words, arranged unstressed, stressed, alternating. Have you got your own Pinterest account? I’d love to do some re-pins, likes and shares if you have got them up! Like it, thanks! I have to figure out the FB thing first. kk 🙂 I’ll keep watch! I like this one! 😀 Fairies wanting cherries or sugar plums sounds very amusing, and those berries do look like they could be fairy plumbs!!! 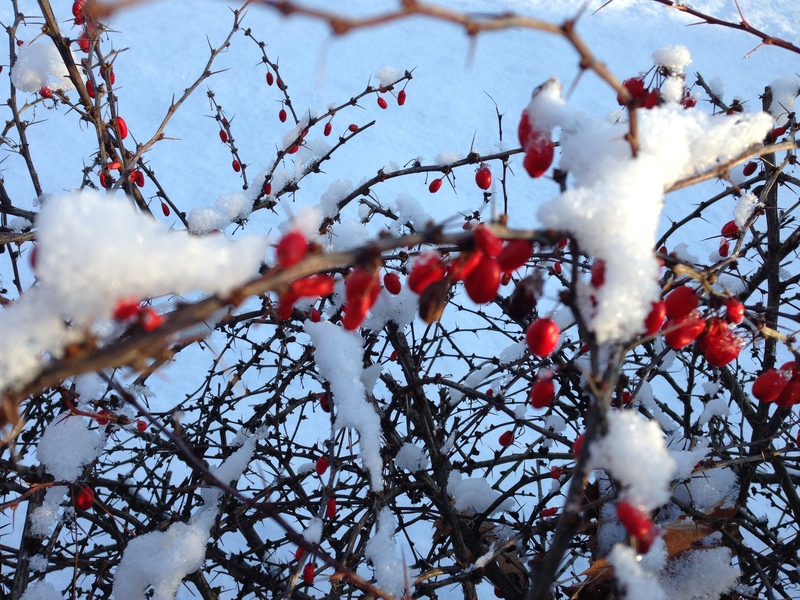 That’s a lovely snowy picture by the way, the red berries really add some seasonal colour! This is just absolutely wonderful. I told you I would learn a new poetry form soon, and I have to say, it was devilish difficult, but I really enjoyed it. LOL Thanks for embracing my blog! Always a delightful learning experience. your words are always spiralling into poetry! just turned back from a tennis session…feel great! You? A bit cold here for tennis. I walk in the mornings, but it is 14 degrees below freezing, so I am working instead. 🙂 Today I have lunch with my friends planned. Yeah! Wish you a wonderful lunch! AnElephant loves your poetry, especially when you write about fairies. And your education is fascinating. thank you Brenda. I learned something new today. And I love the picture 🙂 hugs! It’s a wonderful poem, Brenda! Although you have given a clear description, I don’t think I can get it through my head. The last time someone explained the whole iambic pentameter thing to me, I gave up writing in disillusion, deciding that poetry was deliberately elitist. thankfully I’m a bit more resilient these days and quite content to enjoy what you have written and hold you in awe for knowing and understanding these things. It’s like music. Some notes are softer, and some louder, right? A drum beat is often, da da da DA, da da da DA. Music lyrics have a rhythm, and can almost be sing-song. English is accented, with certain words having the emphasis at a certain syllable. Like “dingbat.” The emphasis is on the ding, and the bat is softer, DINGbat. Imagine it the other way, dingBAT. It doesn’t make any sense that way. So dingbat is stressed, unstressed. It is complicated, and I really avoid writing in Iambic Pentameter these days. Sonnets make my head hurt. Ah, but reading Shakespeare is like reading music. They really put the effort into the rhythm then… Don’t stop writing. You have rhythm in what you write. You don’t have to be aware of it to be using it. Thanks for the encouragement Brenda, and strangely enough, I haven’t read Shakespeare. However rhythm is something I sense everywhere – in all life – and I often have a physical response to it. I now understand a great deal more because of your additional explanation. So thank you very much for taking the time. Where I think it lost me before is that people pronounce things differently, English is spoken in many ways around the world and the written word is not always experienced in the same way as the spoken word, therefore which aspect of words do we choose? In my own writing, I notice that lately I am focussed on long and short syllables as well as a little of stressed, unstressed (although I couldn’t have said so and I realise now they are aspects of the same thing) – I have been referring to it, in my mind, as rhythm – so music is the perfect analogy. No worries, I’m stupid every day religiously. Reblogged this on Adam's Symposium..
Love this, thanks for the lesson too, Brenda!!! LOL I had fun researching, and I thought I should put up what I learned so that I could remember it myself! I think I was asked to try writing a Pathya Vat on a haibun challenge around Thanksgiving, but didn’t have time for the research then. It did take me a long time!! It was fun to write, though a bit restrictive. Hope you are having a great week! The fun and esoteric things I’m learning from you. Definitely enjoying it. LOL Glad they are fun! That was my first ever Pathya Vat. I enjoying writing it.